Preheat oven to 400 degrees F. Spray baking sheet with cooking spray and set aside. Combine bread crumbs and parmesan cheese in a shallow dish. Combine egg white and milk in another dish and beat with a fork until well blended. 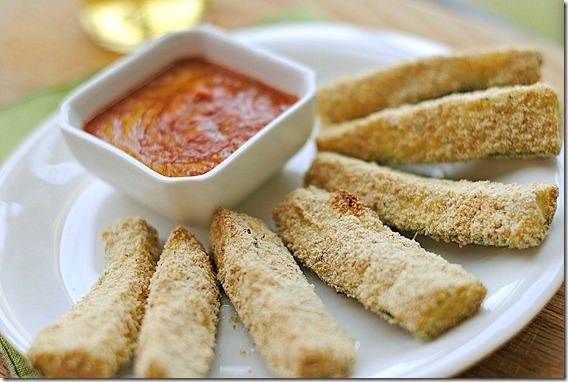 Dip each zucchini stick first into the crumb mixture, then into the egg white mixture, allowing excess to drip back into the dish. Roll again in the crumb mixture to coat. Place zucchini sticks on prepared baking sheet; spray with cooking spray.